Well, here I am, starting my second (and last) day in Macedonia. I calculate that by the time I return I will have spent more time standing in queues in airports than on foreign soil (if one disregards the fact that some of these queues have been on foreign soil), but no matter, I am here. It’s been an extremely busy trip so far. I arrived in the evening and went out for supper with Dejan Trajkoski, the event organizer, fellow Canadian author David Chariandy, Nikola Madeshovski from Ikona, and Dr. Elizabeta Sheleva. 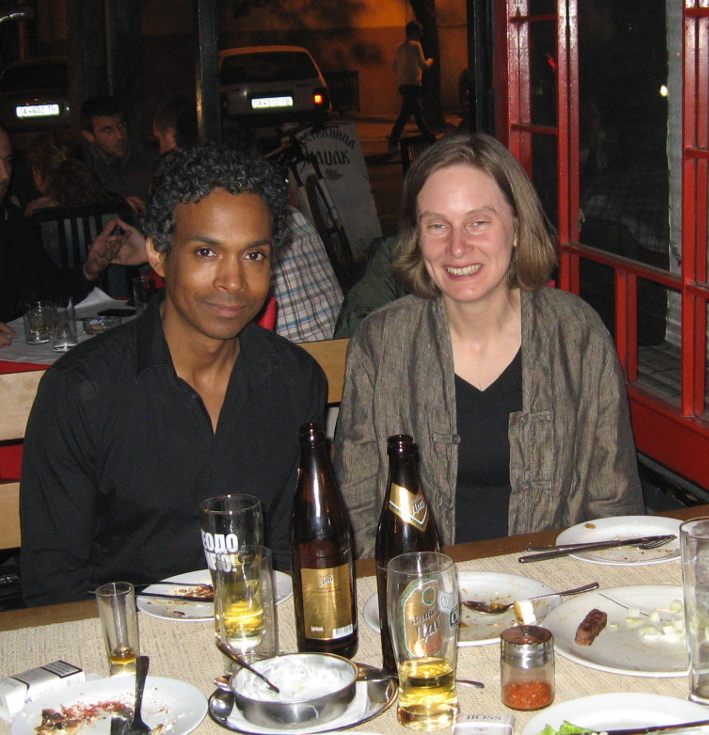 David Chariandy and myself, in Macedonia at last. They had had a busy first day, with the reception with the Canadian Ambassador to Serbia and the introduction of the books being promoted, the Albanian-language translation of David’s Soucouyant and the Macedonian-language translation of my Torrie and the Pirate-Queen. Rumour has it (well, David told me), that Dr. Aleksandar Prokopiev spoke about Torrie with great enthusiasm, so I was well-represented and championed even in my absence. Unfortunately, due to the much-delayed flight (and it turns out it wasn’t fog but merely organizational problems that the airline knew about in advance and I think therefore should have informed me of and changed my flight to an earlier one, since my connection was on record — they have no excuse), the planned reading and book launch with schoolchildren from Skopje on Friday had to be cancelled. However, on Saturday morning I visited the NGO Sumnal, a charity which works with Roma children, and so the official introduction of the Macedonian Torrie and the Pirate-Queen took place there instead. The Roma flag: a cartwheel against grass and sky. The kids were a great audience and my young translator did an excellent job. Although they were very shy, the children did ask a lot of questions and I think we all enjoyed ourselves immensely. They wanted to know if I had tried Macedonian food; I was able to tell them that yes, the organizers had been taking me to restaurants for lot of traditional Macedonian foods and that I even made tavche gravche (a baked-bean type dish with paprika rather than molasses and mustard) at home. They laughed a lot at this; turns out that their thank-you gift to me was a little earthenware dish traditionally used for tavche gravche. After that, I rejoined Dejan, Nikola, and David at an Albanian-language bookstore/cafe in the Old Bazaar, where we were presented at an Albanian-language event focussed on the translation of David’s book. We spent a lot of time touring the Old City with Dejan, Nikola, Elizabeta Sheleva, and Alexander Prokopiev. 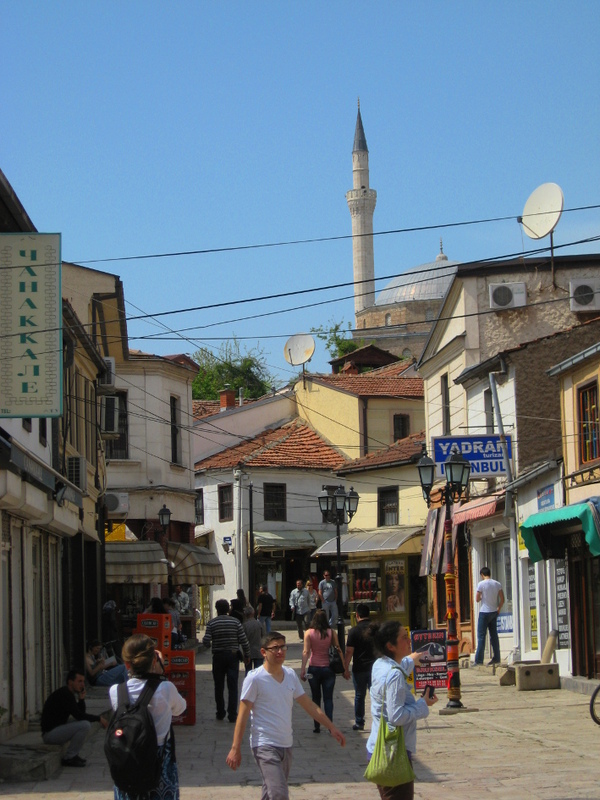 A typical view in the Old City. I think I’ll write up that as a separate post later, with lots of photos. 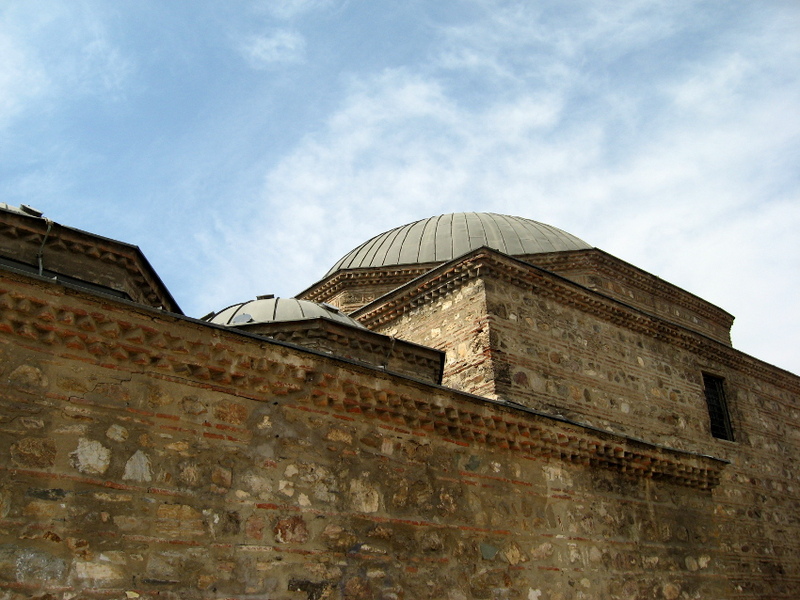 A caravanserai, a bathhouse, a medieval church … it needs its own space. An Ottoman bath-house, now an art gallery. More photos of the Old City to come in a separate post! After a book-signing at an Ikona store, we went out for another traditional Macedonian meal at the “Old City House” restaurant. > And from an arts and culture website. This entry was posted in Dispatches from the second Macedonian expedition and tagged Albanian language books, David Chariandy, Macedonian children's books, Macedonian language books, Roma, Skopje, Sumnal. Bookmark the permalink.